Don't forget to vote! 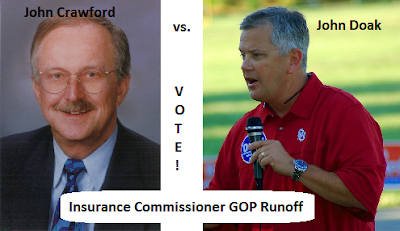 The runoff election is today! While the ballot won't be as full as it was on July 27th, it is still very important that you go vote. The 2nd Congressional District GOP race has come down to two men - Charles Thompson and Daniel Edmonds. The winner will go up against incumbent Democrat Congressman Dan Boren. If you're still undecided in this race, read this post. I endorsed, and recommend voting for, Daniel Edmonds. The 5th Congressional District GOP race is between James Lankford and Kevin Calvey. The winner here will run against a Democrat and two Independents, although the GOP nominee is heavily favored to win in this district. If you're still undecided, read this post. 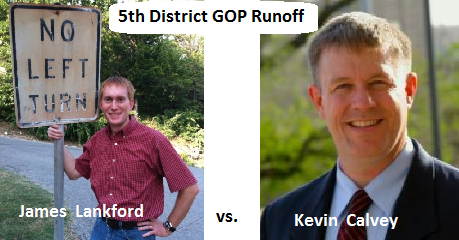 I endorsed, and recommend voting for, James Lankford. The race on the GOP side for Insurance Commissioner is now between John Crawford and John Doak. The winner will face incumbent Democrat Commissioner Kim Holland. This is a state-wide office, so all Republicans are eligible to vote in this race, at the very least. I endorsed, and recommend voting for, John Doak. Only a few more hours before we know our nominees! Let's hope that at the end of the day we have John Doak, James Lankford, and Daniel Edmonds.